Okay, first off I want to say that I have very little experience patterning clothing, and that there are probably a million better and more accurate ways to do this. You should probably skip this section of the tutorial and try... literally anything else. The first thing I did was draw out an overall structure for the jerkin — the shapes of the pattern pieces, how they came together, what the details were for each piece. I tried to log everything I'd learned about the jerkin through all my research into as simple an image as possible, for reference, because although this piece looks simple, it gets complicated quickly once you add all the details. I separated my structure into four pieces (back, front x2, side x2, sleeve x2) because that's what my brain found easiest to grasp, but you can do it however works best for you. Since each strap is laced to the straps on either side, where you separate your pattern pieces doesn't really matter. I then noted down how many strips were in each section (so far as I could count them in photos of the real costume). I also noted the direction of the angled lacing for later reference — that's not important in this step, so you can ignore it. And I noted the measurements, which I'll address in the next section. You'll note that the sides are significantly shorter than the front and back, and there's no slope as they meet the other pieces. That's because, as I discovered recently, the "hole" that the sleeve attaches to is rectangular, not rounded like with a normal sleeve. The sleeve might look confusing, because the dashed line in the middle is the bottom of the sleeve — meaning, that line lies on your underarm. The outer edges of the sleeve pattern piece come together on top of the arm, where they are not laced together, but rather tacked above the elbow with some of the lacing (notated here with those little double lines). So the pointed outer edges of the sleeve pattern come together at the top of the shoulder. Make sure to wrap your head around how these pieces all come together before you move on from this step! That might mean you have to redraw them in some different combinations, or do some further glaring at photos of the jerkin. I'll do my best with this tutorial, but I'm a beginner at making my own patterns and at explaining them to people, so I think we'll all be better off if you do your best to understand rather than blindly following my admittedly mediocre instruction! Okay, get out your handy-dandy measuring tape! If you don't have one, you can use string and a ruler, but be extra careful with this method because it's way easier to get inaccuracies in your measurements this way. 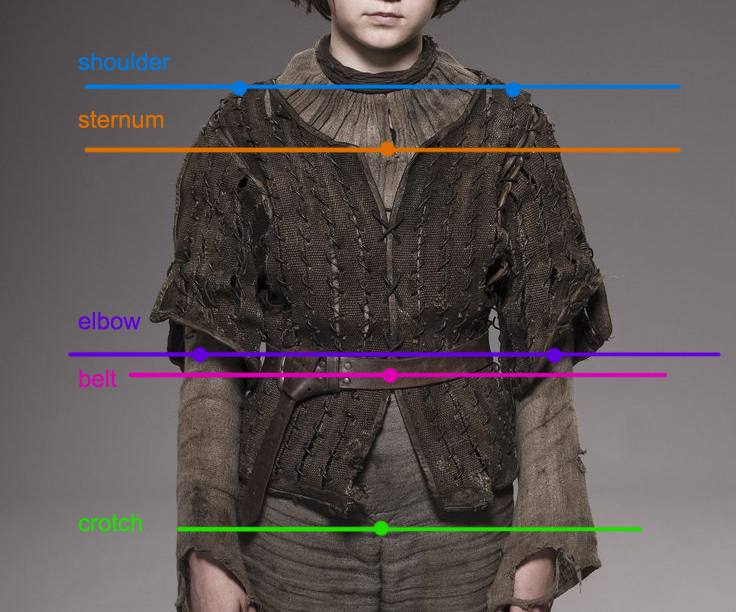 The best points of measurement I could come up with based on photos of Maisie in the jerkin were: shoulder (the top of it; the bony bit that sticks up), crotch (sorry — that's approximately how low her jerkin goes, considering that it's bunched a bit at the waist), belt (which sits at her natural waist), elbow, and then this kind of arbitrary point mid-sternum which I just estimated by how it looks. That sternum point will indicate how low the dip in the front of the jerkin goes. Now, use these measurements to determine the height of each of your pattern pieces. The "front" piece will be shoulder-to-crotch height on the tall side, and shoulder-to-sternum height on the short side. For me, that was 25" and 21". The sleeve hits at about the elbow (it curls and wrinkles at the end, making it look slightly shorter), so the height of the tallest side should be elbow-to-shoulder. (I subtracted 2" for the shorter middle height of the sleeve — it just looked about right to me.) And then the "side" piece appears to end about 2" higher than the top of Arya's belt, so I measured it as crotch-to-belt-plus-2". Now, if you're going straight from patterning into making the actual garment, you don't need measurements in inches for the width of the pieces, since you'll be instead using a certain set number of strips. But I wanted to make a mock-up first (which I highly encourage — it helps you understand how the garment comes together, and also gives you the chance to see and correct any mistakes before you make them with your actual materials). So I assumed there'd be an average gap of about 1/5" between strips, and used that to calculate the width of each piece. For instance, the 10-strip-wide back piece, with 1/5" added between each 1" strip, comes to 12" wide. I made my mock-up from a bedsheet I got for scrap fabric from a thrift store, but you can use any fabric you have lying around, or muslin if you're fancy and want to buy fabric specifically to make mock-ups out of it. Which... I don't, because I'm broke! I measured out each piece according to the numbers I came up with above, and then cut them all out and laid them into place. Ta-daa! Once you've got 'em all laid out and everything looks right, it's time to put 'em all together. I basted the edges and made it into a wearable garment so I could try the fit. I tried it on and realized I probably should've accounted for wider gaps between pieces, since it seemed a bit on the small side — maybe 1/3" instead. But I felt good about it in general and deemed it workable with no changes for my final jerkin. You'll note that the sleeves don't connect to the square things, which is because the sleeve construction is... ridiculously complex and weird. I plan to address that separately in the construction posts, so don't worry about it for now. If your mock-up has any big problems with it, don't be upset — that's why you made the mock-up! Just be glad you didn't make those mistakes with the final piece. ;) Modify your sketches, measurements, etc. as-needed and try again. When you're happy with your mockup, I guarantee you'll be more confident when you finally start cutting into your materials. If you want to make a paper pattern (which may be helpful for those used to working with paper patterns, or for those who didn't make a mock-up) go ahead and do that now! Butcher paper works great for this, or pattern paper, which you can buy at crafting stores. Even newspaper can work! Make sure to use a ruler or yardstick to make sure your lines are straight! When making most patterns, you'd add a seam allowance, but since we're making something kind of nontraditional here, you don't have to worry about that. Also, feel free to make your patterns either with 1/3" (or whatever) added in between each strip to make them real-sized, or without. It won't matter ultimately since you'll only be using the height of the pattern pieces to cut your materials (the width will be determined by your strips). I didn't make a paper pattern for this one because I didn't want to leave my apartment to obtain paper. I do not recommend being lazy. I'm an object lesson, not a role model. That's it for patterning! should have my part 3: lacing blog up soon! If you want to make sure you don’t miss it, subscribe to my blog on the right-hand side of this page.